Was your home or business damaged by the recent storms? Weather related emergencies are an unfortunate fact of life and can’t be avoided. Immediate action after a weather event will limit damages and minimize consequential damage caused by exposure to the elements. But choosing the wrong contractor could be costly in more ways than one. Beware of ‘Fly by night’ contractors that prey on victims in storm damaged areas. Also beware of companies that claim to be ‘insurance claim specialists’, in many cases they may unknowingly put you in a bad position with your insurance settlement. 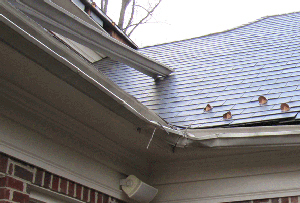 When storm damage affects your area – call the restoration professionals. Pro Built Restoration has certified inspectors and a dedicated claims processing department to ensure that your claim goes smoothly. We also offer industry leading lifetime warranties and are backed by three of the largest manufacturers in North America. If you have experienced storm damage of any kind call Pro Built Restorations’ Rapid response team for immediate assistance. Copyright © 2016 Greener Construction Services. Powered by WordPress. Theme: Spacious by ThemeGrill.